I wish the star background could have been digitally added in. Human eyes are not quite like cameras, and a human eye would have seen some stars in the background. It would feel more like actually being there. It is great to this these re-creations (better than 'originals' as it is the experience we want). The most interesting thing to me about all this is that it seems it was totally unexpected. One of those things that are obvious once discovered but never predicted. The human brain is sluggish! With the sunlit Moon and Earth in the view, you wouldn't be able to see stars there. Stars are very faint and require dark adaptation. On the topic of the image processing, this is a simple but great idea to use colour from another image for a black&white one. Surprised it hadn't been done before for this iconic image. Try looking at the nearly-full moon from anywhere on Earth (and not nearly as bright as the Earth viewed from the moon). How many stars do you see near the full Moon? 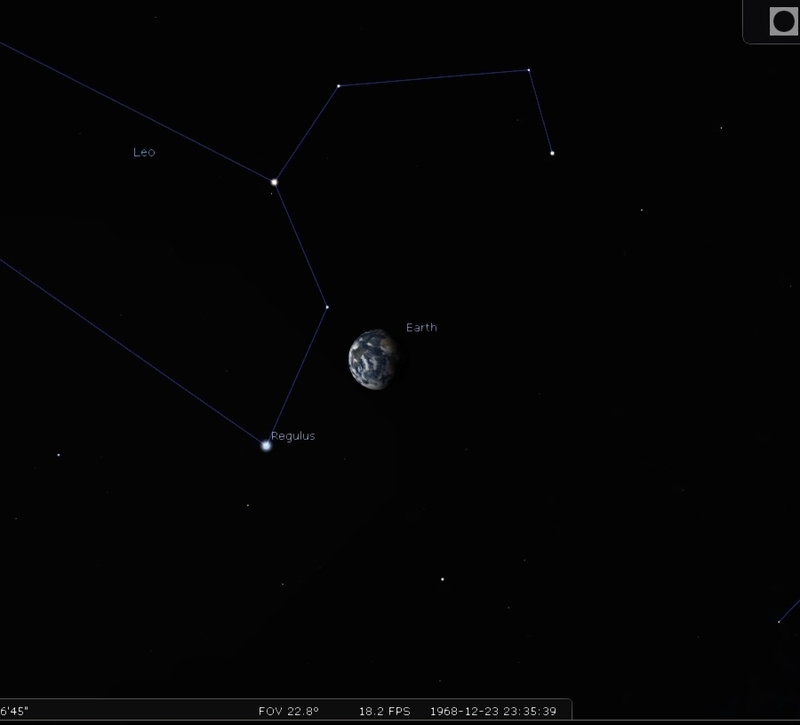 To be able to see our planet as it would appear from distance in real-time would never bore me. That is unless the view gets too congested. The Earth shown here is about 20 times as bright as a full Moon. The Earth straddling the limb of the Moon, as seen from above Compton crater (55.3°N 103.8°E) . Taken by the Lunar Reconnaissance Orbiter in 2015. Well, I see quite a few, right up to within a degree or two of the Moon (and sometimes even transits) when the transparency is good. And the transparency in space is perfect. Our eyes certainly have the dynamic range to see stars when there's something else much brighter in the field. It's not that difficult to see Venus in a sunlit sky. And lunar astronauts reported seeing stars. No, you'd certainly see stars around the Earth if you were observing this with your eyes. But this seems to be a remastered image, representing what we'd see if it were made with modern camera technology. And that still wouldn't show stars unless some kind of HDR processing was used. I am also convinced that without any atmospheric influence in space, stars are also visible to the eye next to a bright object. That's a gorgeous picture. It almost looks fake, even though I know it's not. Beautiful! Kind of an odd question, but do we know the exposure settings and what camera was used for the original photo? <<Earthrise is the name popularly given to NASA image AS08-14-2383, taken by astronaut William Anders during the Apollo 8 mission, the first human spaceflight mission to orbit the Moon. Initially, before Anders found a suitable 70 mm color film, mission commander Frank Borman said he took a black-and-white photograph of the scene, with the Earth's terminator touching the horizon (https://www.lpi.usra.edu/resources/apol ... 08-13-2329). The land mass position and cloud patterns in this image are the same as those of the color photograph entitled Earthrise. I was curious what the land mass was below the cloud cover. I believe it was the African continent. Since that time the number of people on earth has doubled. This APOD is so beautiful and so very moving. It is a stark reminder that the Earth is our wonderful home, where life has come into existence and kept adapting to for at least, I guess, 3 billion years. Probably more. If we want to move somewhere else, like to Mars, and start terraforming it, we will face an uphill battle, to say the least. The brightest star in the photo would then be Regulus (which is the brightest star in Leo, +1.35 mag), but there's no sign of it in any of the scans I looked at. All other stars in that field of view are much dimmer. I doubt they would have seen any of them with the naked eye, having sunlit Moon and Earth in view. 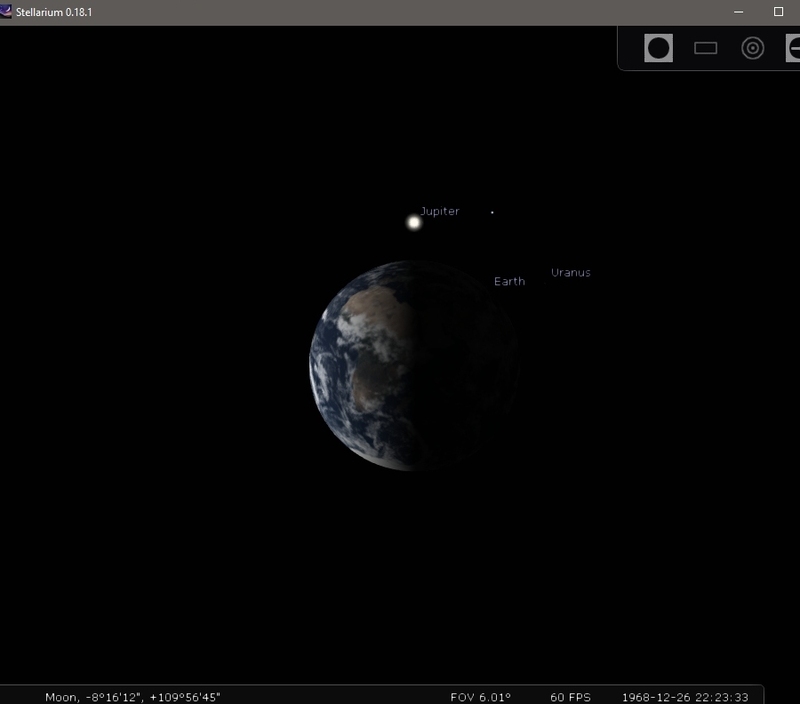 Had this orbit taken place a couple of days later, they would have had Jupiter passing very close to Earth, and that would have made for a pretty sight. I think most of these stars would be very visible to the naked eye, with neither the Moon nor the Earth providing much interference. Our eyes have very wide dynamic range. 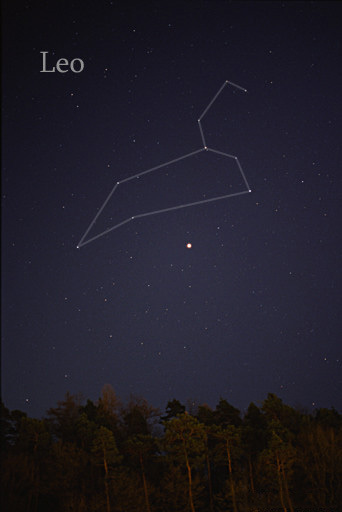 The constellation Leo and the planet Jupiter. <<Written English lacks a standard way to mark irony, and several forms of punctuation have been proposed. The percontation point (⸮) , a reversed question mark later referred to as a rhetorical question mark, was proposed by Henry Denham in the 1580s and was used at the end of a question that does not require an answer—a rhetorical question. Its use died out in the 17th century. This character can be represented using a the Arabic question mark (؟). However my admiration was greatly diminished by them being so careless as to cut off the very last note of the music. Two more seconds of black would have covered it. That is all it would have taken and yet someone either could not be bothered to fix that or never bothered to check their work in the first place. Yes, it's just a video, yes, it's just a small detail... but that was something that would have been so easy to get right, it is astonishing it wasn't.